See also: Helvick Head and Clonea & Ballynacourty Point. Habitat: Estuary, open bay, sand-dunes. Main interest: Wintering wildfowl (especially Brent Geese & Shelduck); wintering and passage waders (including Black-tailed Godwit); wintering grebes, divers & gulls. Regular/near-annual: Slavonian Grebe, Little Egret, Goosander, Long-tailed Duck, Little Stint, Curlew Sandpiper, Ruff, Spotted Redshank, Green Sandpiper, Arctic Skua, Mediterranean Gull, Black Guillemot, White Wagtail, Black Redstart. Scarcer species & rarities: Black-necked Grebe, Cory's Shearwater, Great White Egret, 'Black Brant', 'dark-bellied' Brent Goose, Garganey, Eider, Velvet Scoter, Red Kite, Osprey, Hobby, Little Ringed Plover, American Golden Plover, Long-billed Dowitcher, Semipalmated Sandpiper, Baird's Sandpiper, Pectoral Sandpiper, Lesser Yellowlegs, Ring-billed Gull, Yellow-legged Gull, Sabine's Gull, Little Auk, Alpine Swift, Hoopoe, Waxwing, Golden Oriole, Twite, Snow Bunting. Highlights: Citrine Wagtail (Sept 2009), Cattle Egret (2, Dec 2007-Jan 2008), Booted Warbler (Aug 2006), Bonaparte's Gull (April 2004), Forster's Tern (1985, 1987/88, 1995/96 & 2006), Squacco Heron (May 1994 & Sept 1896), Whiskered Tern (Apr 1994), Lesser Grey Shrike (Sept 1991), Ivory Gull (1988). Undoubtedly, Dungarvan is the most ornithologically important area in County Waterford, both in terms of the numbers of waders and wildfowl that use the mudflats for feeding and roosting (over 20,000 birds on occasion) and the ease with which the birds can be observed so close to a major town. The site is particularly important in autumn, winter and early spring, and details below mainly refer to those seasons. 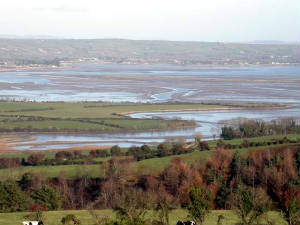 For diversity and sheer numbers of wetland birds, and the chance of finding rarer species, Dungarvan also ranks highly among estuarine sites in Ireland as a whole. Dungarvan Harbour is a large circular basin, almost closed in one corner by a long sand-spit called the Cunnigar, and is fed by several small rivers or streams, the largest being the Colligan, rising deep in the Comeraghs. West of the Cunnigar, the coastline is fringed by an extensive intertidal mudflat with large saltmarsh areas. The sub-surface of the sand-bank on the seaward side of the Cunnigar (the Whitehouse Bank) is composed largely of broken shells, which, in providing a solid substratum, prevents the sand from shifting and thus allows Zostera or eel grass to grow. Nowadays, much of this area is used for commercial oyster farming, but numbers of birds may not be too affected. There is a less extensive tract of Zostera in the shallower and more protected waters inside the Cunnigar but growth here is more prolific than on the east side. These Zostera beds are of significance because of their importance to wildfowl, particularly grazing Wigeon and Brent Geese. Spartina also occurs at Dungarvan but is less widespread than at Tramore Backstrand, further east. 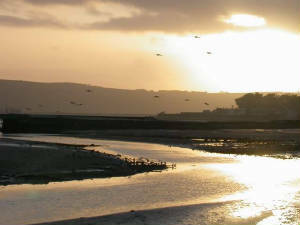 Ornithologically, Dungarvan is of international importance for the numbers of Brent Geese and Black-tailed Godwits wintering on the wetlands. The area is of national or local importance for many other wintering species, and also provides a migration stop-over point for many of the wader species. For example, Oystercatcher numbers are highest in the autumn and ringing recoveries suggest that many of these are from Scottish populations. As at Tramore, the distribution of waders and wildfowl in Dungarvan Bay is quite complex with waders foraging most efficiently on the exposed intertidal flats at low tide, the least suitable time to observe or count them. In general, the highest concentrations of feeding waders at Dungarvan occur on the main mudflats in the inner Bay area (especially Dunlin and Black-tailed Godwits) and along the Gold Coast at the east side (especially Bar-tailed Godwits). The sandflats east of the Cunnigar, although relatively impoverished in terms of invertebrate prey, are favoured by Grey Plover, Bar-tailed Godwits and Sanderling and are of importance for Brent Geese feeding on the Zostera beds, particularly early in the winter. For close views, or detailed counts, the optimum time is at or near high tide – especially higher, ‘spring’ tides that force birds closer to shore. 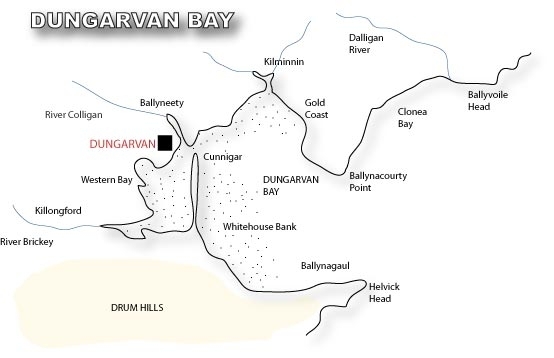 A range of traditional roost-sites are scattered around the Bay, notably at Kilminnin (Barnawee Bridge); the upper part of the Colligan estuary (Ballyneety); the north shore just west of Dungarvan town; and along the Cunnigar. Visits to these sites at, or shortly before, high tide can provide spectacular views of the birds, but disturbance should be avoided. Wetland counts at Dungarvan are usually made over several hours by observers strategically placed to cover all the known roosts. But even casual visits can be productive, and numbers and variety of species can change from week to week, thus the area is always worth checking for new arrivals (perhaps especially after severe winter conditions further north). Access: From Dungarvan, Kilminnin is reached by taking the coast road at Abbeyside. If approaching from the east, on the main Waterford-Dungarvan road, head coastwards at the signpost for Clonea (before the turn-off for Cappoquin/Killarney) and the Gold Coast is just over 3 km further on, on the seaward side of Kilminnin Bridge. If coming from the east on the narrower coast road, Kilminnin Bridge is 5 km west of Ballyvoyle. The coastline from Barnawee Bridge out to Ballynacourty pier can be viewed from the narrow road along its length, but the safest viewing points are at Kilminnin and the pier. The walk along the Gold Coast is reasonably short and many of the birds can be seen at close range for a few hours before or after high water, when some of the mudflat is uncovered and Brent Geese and waders are still feeding. At any time of tide, the waters offshore should be scanned as good numbers of feeding Red-breasted Mergansers and Great Crested Grebes are usually present. 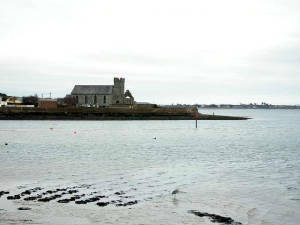 These are best viewed from Ballynacourty pier. Grebes may be scattered across the bay but a careful scan (ideally with a telescope) is worthwhile, as Slavonian Grebes were regular until very recently, and other rare grebes can occur. Great Northern and Red-throated Divers can also be seen off the pier throughout the winter, and Black Guillemots occur in small numbers. Other seabirds can include skuas, large feeding flocks of Gannets and Sandwich tern on occasion, and scarcer gull species like Glaucous or Mediterranean. Closer to high tide, waders concentrate in tighter flocks at Kilminnin (Barnawee) itself and can readily be viewed at close range from a car window – both north of the main road, and between the road-bridge and the old railway-bridge. Roosting flocks here typically include many Redshank, Bar-tailed Godwits and Turnstone, with large flocks of Knot occasion. Black-tailed Godwits regularly feed in the shallows north of the road, at low tide. 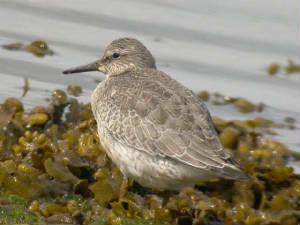 Whimbrels are regular in spring and Common Sandpipers throughout much of the year (wintering occasionally). There is also potential for rare waders, and Long-billed Dowitcher has been reported here. Little Egrets are nowadays frequent here, and keep an eye out too for Kingfisher, often seen near the channel. Brent Geese can be viewed at close range between the two bridges, and Goosander has occurred here in several winters. Forster’s Tern has also occurred here. From the path along the Colligan river to Ballyneety Bridge, just outside Dungarvan town to the north-west of the bypass road, many wader and wildfowl species can be seen at close range. As elsewhere in Dungarvan, the ideal time is an hour or so on either side of high water, when many of the birds roost or feed close to the roadside wall. September is the best month for Curlew Sandpipers and flocks of 90 or more have been seen here in company with impressive numbers of Black-tailed Godwits, which occur right through the winter. Redshank also favour the area, both for feeding and roosting, with Greenshank in smaller numbers. 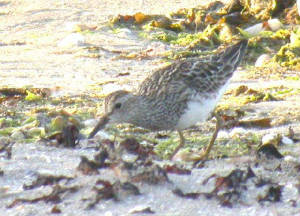 This is the most regular Co Waterford site for Ruffs, especially in autumn. Good numbers of Shelduck can be seen, particularly in early spring. 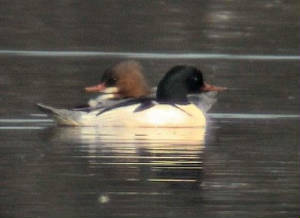 There are usually a few Little Grebes, Red-breasted Mergansers and Goldeneye in the channel, and up to 3 Goosanders nowadays winter here regularly. Dungarvan dump, just above Ballyneety Bridge, was formerly a good area for gulls, with many of these using the mudflats below the bridge for roosting; the dump is now closed, and numbers of gulls are smaller, with Glaucous and Iceland Gulls much scarcer than in the past. But the Ballyneety area is still productive for Mediterranean Gulls, and has also had Ring-billed Gulls and single Bonaparte’s and Yellow-legged Gulls. Dungarvan town offers good opportunities for birdwatching and the walk from the Sports Centre past the old swimming baths and right around the quays can be extremely rewarding. The area near Abbeyside church also offers a good vantage point. Many of the diving species that winter in Dungarvan Bay will be present in small numbers in the channel offshore, and at very close range at times. Great Crested Grebes, Red-breasted Mergansers and Goldeney are the most regular, but occasional Slavonian or Red-necked Grebes are seen. Great Northern Divers, usually single birds, may also be present. Brent Geese will almost always be present, feeding around the seaweed near the swimming baths or on the playing fields by the Sports Centre (where tight flocks of 600-800 geese can occur). Watch out for colour-ringed and for 'Black Brant' & ‘dark-bellied’ Brent here. Mediterranean or Little Gulls can occur among the gull flocks inside the tip of the Cunnigar, and Sabine’s Gull and Little Auk have been seen. On the main Cork road, just outside Dungarvan at the Industrial Estate, the mudflats are good for feeding Black-tailed Godwits and Knot, viewable from a car or by walking along the road. The optimum time for this area is either half-tide or neap tides, when less mudflat is covered and feeding flocks of over 500 Knot and 1000 Black-tailed Godwits have been seen. At high tide, the water laps close to the road and large numbers of Shelduck on the water is usually the highlight, particularly in winter, though good numbers of Wigeon and other duck may be seen at greater range. Moderate numbers of duck (sometimes including Pintail or Shoveler) and roosting waders occur all along the coastline west from here as far as Killongford, although coverage may require a long walk along the shoreline. Small flocks of Brent Geese often feed along the tideline here. Killongford Bridge is west of Dungarvan town on the main Cork road, just before the turn-off for Ring and Helvick Head. The river Brickey flows into Dungarvan Bay here and the channel above and below the bridge is worth checking for scarcer species like Common Sandpiper or Spotted Redshank. Two Squacco Herons were found here in May 1994. Further up the Brickey (take a right turn just west of the bridge), Green Sandpipers can be found in most months (much of the riverbank can be walked), and Night Heron has occurred. The mudflats further out towards Western Bay area are also used by waders and wildfowl for feeding and roosting. The area is best viewed from vantage points at farm gateways along the road out towards Ring. This is a particularly good area for Black-tailed Godwits, Lapwing and Golden Plover, with huge flocks often present. The mudflats are often thronged with feeding Dunlin, immediately before and after high tide, this being one of the last areas to be covered by the tide; large numbers of Curlew Sandpipers have also occurred in autumn. This is also a good area for Shelduck, Wigeon and Teal, occasionally Shoveler or Pintail. The Cunnigar, viewed from the main Ring/Helvick road. Access: Take the main Cork road outside Dungarvan and turn off left for Helvick Head where signposted. After the hairpin bend, take the road left half-way up the hill and continue on this narrow winding road for about 2 km. Then take a sharp left at a farmhouse down to the base of the Cunnigar where there is ample car-parking. The Cunnigar may be the best winter birdwatching location in Dungarvan Bay, indeed in Waterford, and is certainly worth a visit. The Cunnigar can be walked in safety along its length (a distance of about 3 km) and in winter is impressive, spectacular and alive with birds. This is also the top site in Waterford for rarer waders in autumn, with species recorded including Little Ringed and American Golden Plover, and Baird’s, Buff-breasted, Pectoral and Semipalmated Sandpipers. The Cunnigar is one of the main high-tide roosts in Dungarvan, so, ideally, time your visit to coincide with high tide or within an hour of it and expect large numbers of birds anytime between late August and March/April. September is a particularly good month as many of the birds may still be in summer plumage and of course, with luck, weather may be favourable with relatively long daylight hours and good light. The early autumn is also the best time for roosting Oystercatcher, with up to 2000 birds recorded. It takes 2 to 3 hours to walk the Cunnigar and back and in excess of 30 species of birds should be encountered. 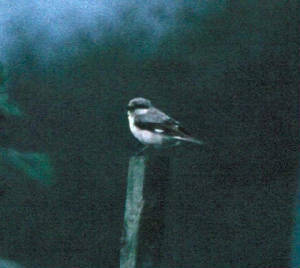 In autumn, pipits, Pied and White Wagtails and Wheatears are frequent. Sandwich Terns often roost on the railway sleepers used to protect the fragile sand-spit from coastal erosion, and Roseate Tern is occasional. Migrant butterflies like Painted Lady, Red Admiral or even the rarer Clouded Yellow are regularly recorded from April to October. One of the attractions of the Cunnigar for wetland birds is that it is relatively undisturbed, apart from casual walkers, occasional birdwatchers and the odd shooting party. Inconsiderate birdwatching can, however, result in excessive disturbance of roosting birds in winter at any wetland site, but particularly on the accessible Cunnigar. With care, good views can be had without causing disturbance. Access: On leaving the Cunnigar, turn east (left), continue on past the Irish College and turn left again to take the main road to Helvick Head. Once past the public house (beyond a sharp turn in the road) watch out for signposts to Ballynagaul on the left and follow one of the narrow roads down to the pier, where there is some car-parking. Small numbers of waders can be seen here, sometimes at very close range, and, being far out in Dungarvan Bay, there are sure to be seabirds offshore. Greenshank, Oystercatcher, Turnstone and Redshank are the more usual species in winter but you may also find small numbers of Brent Geese, mostly on the shoreline left (or west) of Ballynagaul quay. The pier here is one of the best location from which to check Dungarvan Bay for Slavonian and Great Crested Grebes and for divers (including Black-throated Diver on occasion). Black Redstart can also occur in late autumn and winter, here and elsewhere around Dungarvan. Just north of Ballynagaul, another access road leads down to the shore at Knockanpower Lower (signposted Meitheal Tra na Rinne). Good views can be had of Brent Geese and waders here. In winter 2004/2005, up to 10 wintering Chiffchaffs were present in the scrub along the beach, at the mouth of the stream below the oyster-processing factory here.